Advancement in Elizabethan society depended largely on being noticed by the Queen. In an age where the monarch wielded enormous powers of patronage and with so many others jostling for her attention, your house and the hospitality you could provide were effectively the biggest advert you could make. As a result of this, the houses of courtiers became destinations for the monarch as she made her way around the kingdom, and these homes developed both architecturally and stylistically to not only accommodate, but to also impress. Known as Prodigy houses, they are now some of the most beautiful in England, and a fine smaller example, Brereton Hall in Cheshire, is currently for sale. Surprisingly, the genesis of the Prodigy house actually lies far from the bucolic charm of the countryside, and instead can be found on the banks of the Thames in central London. Built in 1547-1552 (dem. 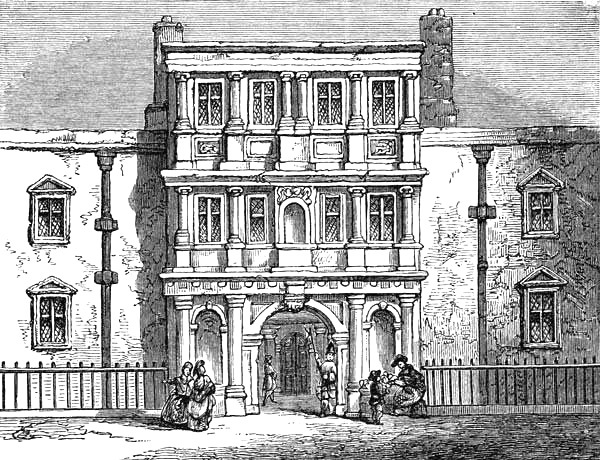 1776), the old Somerset House was the home of Lord Protector Somerset, and was the first classical building in the UK – a remarkable symmetrical façade which proclaimed the dawn of a new architectural style. Although the core of the building was late-medieval, the decoration was resolutely classical; the gateway on the Strand was a development of the Roman triumphal arch, combining the three orders with pedestals and the pairing of windows and pediments. The influence of Somerset House began to spread with the style adopted by those in the Lord Protector’s circle. In the 1540s, at Lacock Abbey, Sir William Sharington, who was close to the Lord Protectors brother, added Renaissance features to his newly acquired monastic home. So although elements of the new language began to be used elsewhere first, Longleat, built in 1572-80 by the Lord Protectors steward, Sir John Thynne, was the first of Prodigy houses; a new, larger style of country house which embraced the classical and which were explicitly designed for show. Few can mistake the remarkable façades of Longleat, a glittering statement of confidence, wealth and architectural learning. Thynne was part of the Lord Protectors circle and therefore out of favour under Queen Mary’s rule after 1553, so he wisely retired to Wiltshire to concentrate on applying what he had learned of classical architecture to the new house he was building. Sadly, the early results are unknown as the house burnt to the ground in 1567, forcing Thynne to start again. A new model was created in 1568 (this time in conjunction with that genius of the age Robert Smythson), the new façades were added in 1572, and when the Queen visited in 1575, it was complete up to the second floor. Interestingly, the third floor may have only been completed after his death in 1580, Thynne having spent a lifetime and a fortune creating one of the greatest examples of Elizabethan architecture. Smythson was to become one of the most accomplished of the new breed of specialist; the architect. Officially his title was ‘Queen’s Master Mason’ but his influence, though the Royal Office of Works, was such that his architectural guidance was to become pre-eminent. After the success of Longleat, Smythson’s next project was the grand extravaganza that is Wollaton Hall, Nottinghamshire, built between 1580-88. Sir Francis Willoughby, the High Sheriff of Nottinghamshire, had entertained Her Majesty previously but now wished to create as great a statement as any member of Court. Drawing on the traditional broad plan of a castle, with all its heraldic and chivalrous echoes, Smythson adapted it to accommodate the new classical language (though even this was inspired by the Poggio Reale in Naples, which Serlio mentions in his third book). Although the plan of the house still followed the processional structure of royal apartments, the house radically dispensed with the central courtyard arrangement and instead created a huge central ‘keep’, but one without any pretence of defence. This was about glass, power, ornament and display. Wollaton Hall was the last house with a documented link to Smythson but there is strong circumstantial and stylistic evidence that he was linked to two of the other great houses of the age; Worksop Manor, Nottinghamshire, and Hardwick Hall, Derbyshire, both seats of the Shrewsbury family. Worksop Manor was another departure for Smythson; another variation of the castle plan but now much more loosely applied. Completed by 1585, the design was a compressed and heightened version of Longleat and without clear precedent in earlier Italian work. Hardwick Hall – famously ‘more glass than wall‘ – neatly fits into this narrative of Smythson and the nascent English Renaissance. Built between 1590-97, it is a simplified and reduced version of Worksop – and all the more elegant for it. Built by Bess of Hardwick, it enjoys a prominent site (as with Longleat and Worksop), to better display its charms. Where Hardwick can claim renown is as the first house to be built with a cross-hall, running from front-to-back in the centre, a derivation of Palladio‘s Villa Valmarana, and is therefore some of the earliest evidence of the use of Palladio’s teaching. Influential though Longleat was, a wealthy man may always wish to find his own way of expressing conformity and so it proved with another group of the Prodigy houses built by William Cecil, 1st Baron Burghley from 1571 (b.1520 – d.1598), the Queen’s Secretary of State and then Lord Treasurer. Powerful and politically astute, Cecil became one of the most important men in the country and one very close to the Queen. As such, her progresses often took advantage of his hospitality, leading to the creation of two of the great Prodigy houses. The first was perhaps one of the largest and grandest non-royal residences ever built; Theobalds in Hertfordshire. Originally a smaller house, as Burghley said, ‘[it] was begun by me with a mean measure but encreast by occasion of Her Majesty’s often coming‘, and then completely rebuilt in her honour. It was a grandiose gesture which spread across five courtyards covering a quarter of a mile and anyone seeing it could not fail to be awed by the size and the statement it made of homage to the Queen, who visited 13 times in all, often treating it as one of her own palaces. Sadly, the house became one of the many casualties of the Commonwealth; listed for disposal, it was largely demolished by 1650. Cecil’s other house, Burghley in Lincolnshire, was more conservative and, in comparison, modest, though still on a grand scale. Built between 1558-57, the house displayed all the typical Elizabethan swagger but in a compact form with an impressive entrance front which was one of the last to use the style of the high turreted gatehouse and towers at each end. One of the most innovative architectural feature of Burghley is the celebrated three-storey tower which dominates the inner courtyard. Developed from the gateway at Somerset House, the Burghley tower features stacked arches, surmounted by a clock which acts as a plinth for a huge obelisk. The house today survives as the seat of descendants of the Cecil family. Though there are many other examples, two other houses are of particular note in this era of extravagant architecture. 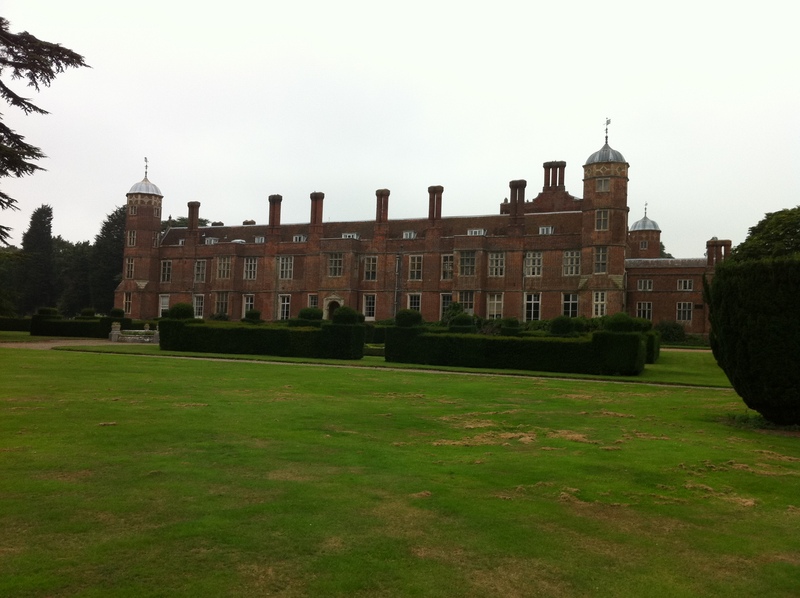 One that can still be seen today, though is now enjoyed more by the pupils in its current use as a school, is New Hall in Essex, where the great stretch of the main lodgings is lavishly fenestrated. Built by Thomas Radcliffe, Earl of Sussex, around 1573, it was explicitly designed for the Queen’s use with a full suite of royal apartments: great chamber, presence chamber, privy chamber, withdrawing chamber, bed chamber and inner chamber. The other, now sadly lost, is the vast palace of Holdenby Hall, Northamptonshire, a house which influenced those who later also wished to build to impress. A late starter, Sir Christopher Hatton (b.1540 – d.1591), began the construction of his new house in 1571 as a direct, though amicable, challenge to William Cecil, though with an element of flattery in that it sought to mimic Theobalds. Expressly designed to accommodate a Queen who never actually visited, by the time of its completion in 1583, Holdenby had few equals as possibly the largest house in the country; an enormous Renaissance palace with symmetrical façades stretching 380ft on the garden front, almost all of it glass. Hatton’s ambitions sadly ran far ahead of his wealth and his attempt at establishing himself as Cecil’s successor failed, partly due to being bankrupted by the enormous expense of building Holdenby, but also by his death less than ten years after completing the house. Holdenby became a royal palace of James I in 1607 but was sold under the Commonwealth and demolished by 1651, with a smaller house later rebuilt as a new Holdenby Hall, one clearly linked architecturally to its more grand forebear. The plan of the early prodigy houses still owed much to the traditional pattern of the Royal progress which required that courtiers accommodate the monarch and their retinue according to the strict rules of precedence and access practised in London. This meant a series of courtyards and state apartments, each stepped back with a clear route of progress through them. This naturally forced compromises in the early use of classical, leading to it being external decoration applied to an essentially medieval plan. However, change was taking hold and in the now-for-sale Brereton Hall, it was reversed with a non-courtyard layout married to a distinctly historical feature, that of the grand gatehouse entrance. Whilst the courtiers were engaged with their vast and expensive projects, others also wished to show their allegiance through architecture, adopting the style of those close to the Queen, but scaled to their own circumstances. Brereton was completed in 1577 but was in one way, curiously behind the times as it was one of the last to be built with a grand gatehouse (added in 1586) – though it was more impressive than it appears today. The design was novel in that one tower was, in fact, a staircase leading to a small room in the domed turret (similar to Barlborough Hall, designed by Smythson) but with the addition of a bridge which crossed to a banqueting room in the other turret. The rest of the house is typical of the smaller gentry Elizabethan houses, such as Cobham Manor in Kent (completed 1597), or Easton Lodge in Essex (burnt down 1847), which rejected the local vernacular and instead adopted that of the Court. In doing so, Brereton was a fine example, decorated with the Queen’s coat of arms both inside and out. The Brereton line died out in 1722, with the house passing to the Holtes of Aston Hall, before being sold in 1817 to John Howard of Hyde. He unsympathetically set about altering the house, radically changing the internal layout and removing the turrets of the gatehouse, adding instead what, in 1909, Country Life magazine called ‘battlements of outrageous proportions and cumbersome mouldings‘. The house later became a school which closed in 1992 and then passed to the headmistress’ daughter who, with her husband, carefully and sensitively restored it as a home before it was sold in the late 1990s to a technology millionaire, who then sold it in 2002 for around £2.25m. The house is now again for sale at £6.5m; certainly expensive, but by comparison with the illustrious and much grander architectural ancestors, not prodigiously so. This entry was posted in for sale, News and tagged brereton hall, burghley, holdenby hall, jackson-stops & staff, lacock abbey, longleat, new hall, old somerset house, robert smythson, theobalds, wollaton hall, worksop manor. Bookmark the permalink.